Do you reside in a dry desert area or are you in the Pacific Northwest where it’s damp all the time? Did you know that your instruments and the wood they’re constructed of are very susceptible to these varying degrees, much like our skin and hair? I’m one of those people who’s constantly applying lotion and other products to keep my body and hair hydrated and smooth looking, because we live in a dry climate. I’m also one of those people that maintains a constant 45-50% humidity level in my home to keep my instruments in the same condition. How do I know this? I have a hygrometer on the back of our piano, above which several different brands and types of instruments hang. I’m also one of those people that has a bit of an OCD complex and checks said hygrometer daily. If it starts to get low, I turn the humidifier on for a couple of hours to bring that level back up. If it’s getting a little high, I crack a window and turn the vent fans on. All of our instruments here at Teton Guitars sit in a humidity controlled warehouse, monitored much like my own home. When we sell these wonderful items, they are sent to (hopefully) another humidity controlled store, but what happens when they go home with your customers? Are they as vigilant as you and I? Do they own a hygrometer or a humidifier? Do they even know what a hygrometer is? I’m proposing a simple solution to avoid potential misfortune in this arena: education, education, education. Talk to your customers about proper humidification. Stock a variety of humidifiers for them to purchase along with that new guitar, violin, mandolin, ukulele, etc. Keeping instruments in cases is also beneficial, especially if they are not equipped to humidify their entire home. A small upfront investment will save both them and you time and money repairing cracks, warped tops, lifting bridges and other problems that arise when wood is shrinking or swelling depending on your climate. Lucky for you, our wonderful independent music owners, your local Teton dealer sells many great humidification options for all instruments. We also have an intelligent, well-versed sales team that can assist in picking the best product for the particular needs of your area. In summary, if your skin feels too dry or too moist, then your instruments are probably feeling the same. 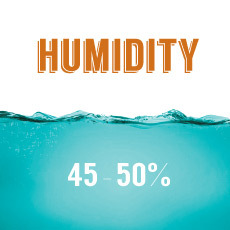 Keep an eye on your humidity levels and make sure your customers are doing the same. In the end, we’ll all be a lot happier and have more time to create beautiful music on our well-cared-for instruments. Please send any questions or comments to team@tetonguitars.com.